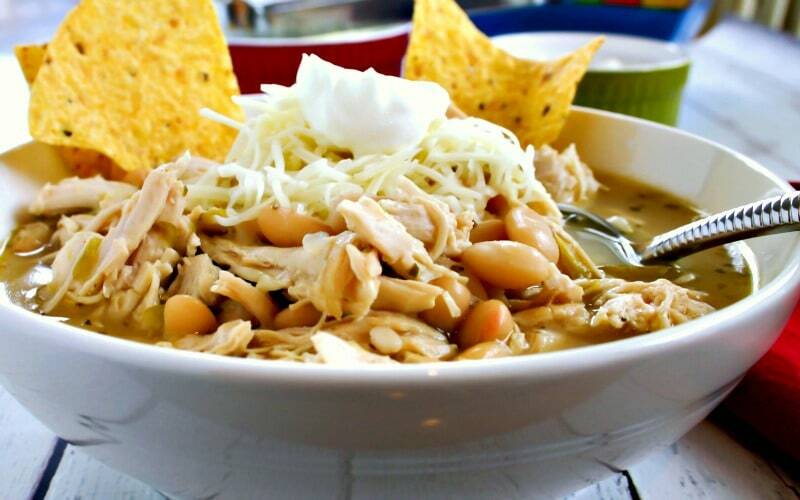 Snowy days call for warm, hearty soup like my Favorite White Chicken Chili seasoned with cumin, oregano, cayenne pepper, and green chilies. 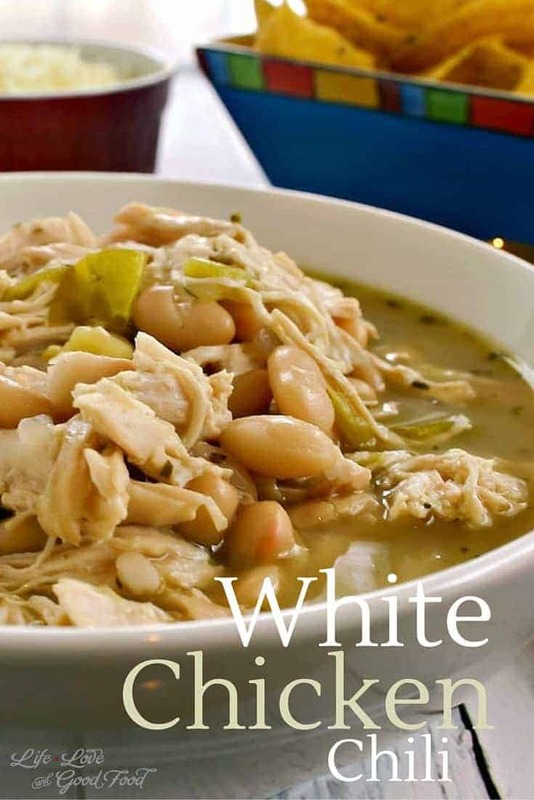 Snowy days call for warm, hearty soup like my Favorite White Chicken Chili seasoned with cumin, oregano, cayenne pepper, and green chilies. 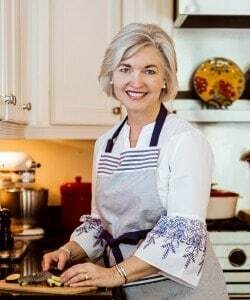 I’ve been making this soup for many years, and in fact, it was one of the very first recipes that I posted when I started my blog a little over two years ago. 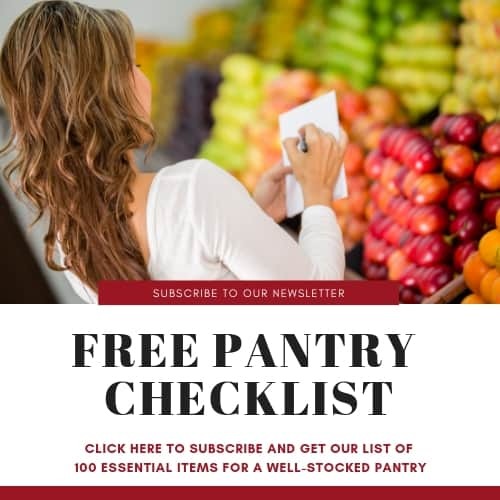 At that time, I started out by sharing tried and true recipes (which I still aim to do) that my family had always enjoyed. This chili has been the star of many football gatherings and winter sleep-overs. The recipe came from one of our favorite local restaurants, Calhoun’s), and in fact, is still served on their menu. Sometimes I serve this chili with homemade Mexican Cornbread Muffins, but when I’m pressed for time, I serve it with tortilla chips and extra Monterey Cheese and sour cream. Even so, this soup is delicious all on its own! One thing I love about this chili is that it is so easy to prepare. Often, I’ll toss the ingredients into the Crock Pot in the morning and let it simmer all day for a quick-fix dinner after work. 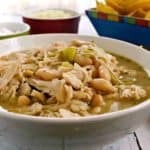 The photo below of White Chicken Chili in the big green soup mug is the one that I shared with my original post back in November 2013 (the month that I started blogging). What do you say? Think my photography skills have improved any these past two years? Boy, I sure hope so! It’s been kind of nasty out there today — stay safe and warm, Friends! Heat oil in large saucepan over medium low heat. Sauté the onion until tender. Add garlic, chilies, and spices. Continue to cook and stir the mixture for 2-3 minutes. 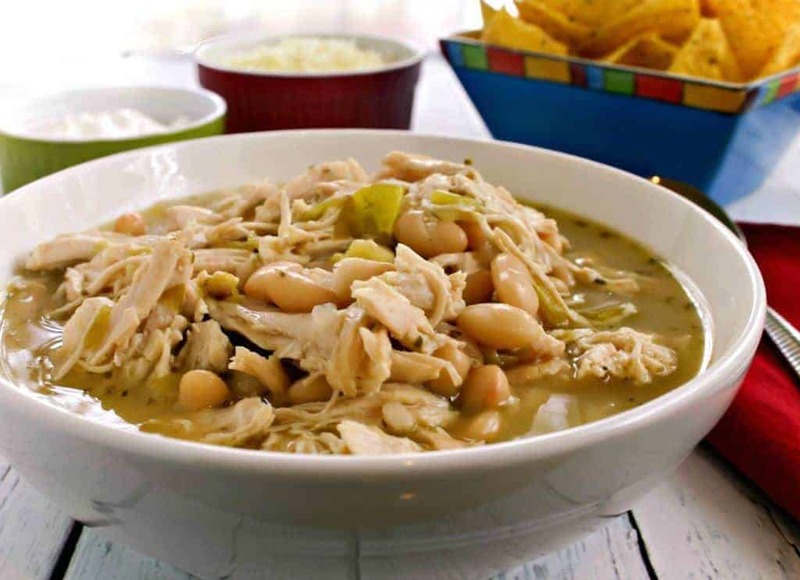 Add chicken broth, chopped chicken, and beans. Bring to a boil; reduce heat. Simmer 15 minutes, stirring occasionally. Remove from heat. Slowly stir in the cheese until melted. Serve with your favorite cornbread or tortilla chips.